Westlake Ace Hardware locations in the Greater Omaha Metro area hosted their third annual Teddy Bear Drive for Children’s Hospital & Medical Center. 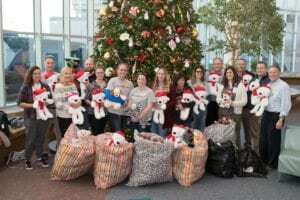 They invited customers to “donate smiles” by donating new teddy bears for children and families who will not be spending their holiday at home this year. Thank you for donating dozens of smiles! Next post: Red Bull and Premier Midwest Beverage Company provide creative fun!